It's hard to imagine my day without a cup of coffee (or four). The smell. The warmth. The caffeine. Coffee is definitely my preferred way to wake up in the morning and my preferred boost, for better or worse, in the afternoon. If you're a coffee lover, I'm sure you can relate. But what about all the coffee grounds you're left with? You might want to think twice before throwing them out. Coffee grounds have a lot to offer in the garden, and they're free! Keep reading for some amazing ways to put your coffee grounds to use. Coffee grounds added directly to your compost are a great source of nitrogen, according to Oregon State University. Keep in mind, however, that high-nitrogen materials need to be balanced with high-carbon materials, such as sawdust, sticks, twigs and dried leaves. If compost starts to produce a stench, it's a good sign you have too much nitrogen and not enough carbon. So while coffee grounds are a great addition to any compost pile, you can overdo it. Not to worry: Read on for many more ways to use those coffee grounds. Hardwood mulch utilizes nitrogen in the soil as it breaks down (think about how compost works), which means less nitrogen is available to plants. Adding coffee grounds, which according to Missouri Botanical Garden are 21 percent nitrogen, can help to keep wood mulch from tying up too much nitrogen from the soil. Organisms in the soil will break down the coffee grounds more quickly than the mulch, providing additional nitrogen for the breakdown of the mulch itself. If your hostas and spring veggies get obliterated by slugs, try using coffee grounds as a deterrent. Northwest Edible Life finds that slugs aren't too happy about crossing over a barrier of coffee grounds. Considering their smooth, slimy skin, I imagine it's pretty uncomfortable rolling around in coffee grounds. If you have an ongoing battle with slugs, and you have coffee grounds to spare, it definitely can't hurt to try! Sprinkle a circle of grounds around your targeted plant, reapplying as needed. Due to the high-nitrogen content, adding too many coffee grounds directly to fertile, already loamy soil can be risky. However, if you have an area of soil in desperate need of drainage and amendment, coffee grounds can be a great addition. Washington State University says coffee grounds are a good food source for earthworms, which we all know are great for our gardens. Earthworms pull coffee grounds deep into the soil, adding nutrients and improving soil structure. Now that we know worms like coffee grounds, it would make sense to add grounds to a worm bin. Vermicomposting, composting with worms, is a great option for anyone who wants to compost but doesn't have the space. SF Gate cautions against feeding worms too many coffee grounds, however. As a general rule of thumb, it should be OK to add coffee grounds to a worm bin with other kitchen scraps during regular feedings. If a compost bin or vermicomposting aren't options, you can still get more use out of your coffee grounds before tossing them out. One option is to steep coffee grounds in water overnight. The Spruce suggests a ratio of ½ cup grounds to 1¼ gallons of water. Strain the liquid and use it as a natural fertilizer every so often to give plants a boost. Washington State University points to research that claims coffee grounds help to suppress certain fungal rots and wilts. While more research needs to be done, you can try scattering a thin layer of coffee grounds around plants such as cucumbers, beans, tomatoes and spinach for the prevention of fungal rots. If veggies aren't your ticket, maybe a green lawn is. James Grierson at I Need Coffee simply mixed coffee grounds with horticultural sand and applied the mixture to his lawn, citing good results. Coffee grounds aerate and fertilize the soil at the same time and are a great alternative to chemical lawn fertilizers. Use one amazing food to grow another. Check out Storm the Castle's tutorial and learn how to grow your own pearl oyster mushrooms using coffee grounds. This one isn't for use in your garden, necessarily. But what gardener doesn't need a great, exfoliating hand soap after planting? Check out this recipe for coffee spice bar soap by Frugally Sustainable. Coffee grounds can benefit your garden in so many ways. Keep in mind, however, that some plants like coffee grounds more than others, so you might want to do more specific research before getting started. In general, start slow with your use of coffee grounds, and keep your own notes. Every garden is different and has different needs, so results with using coffee grounds can vary with each garden scenario. 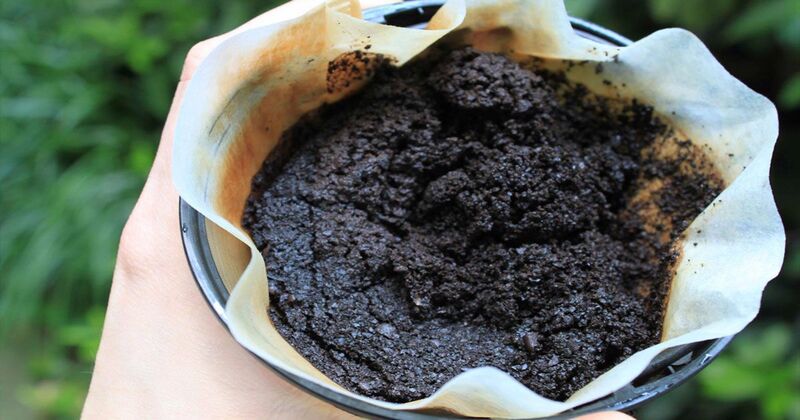 Do you have any experience using coffee grounds in your garden? Share what you tried and what you have learned!